Sometimes the smallest things take up the most room in your heart. Keep those you love close to you with our Grandmother's Bracelet. Create a custom bracelet you will cherish for a lifetime. Stamp your grandmother name (ex. Mimi, Nana, Grammy) on the inside and all the kids/grandkids on the outside. With this personalized family name bracelet you will have all of your family wrapped around your wrist at all times. 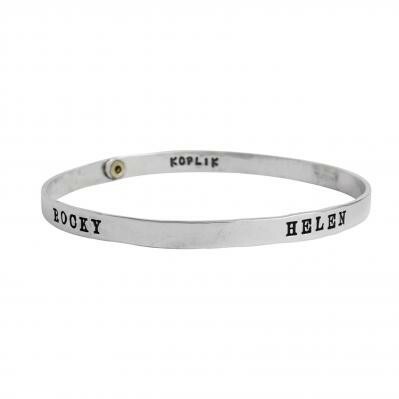 Have each family member's name, or just the names of children or grandchildren stamped on this bracelet. We will also stamp something on the inside - like the year your family was established (wedding year) or your last name. Simple yet meaningful, we are in love with the Family Bracelet and you will be too! The price listed is for one inside stamp and two outside stamps. For the grandmother of two customize the inside with your grandmother name such as Nana, Mimi, Grammy etc or just a word that is special to you like Love, Family, Everything, My World. On the outside put the names of your children and/or grandchildren. You can also include words such as LOVE and FAMILY. Be creative and design a bracelet that is meaningful to you. Dimensions: The width of the bracelet is approx. 5mm and all silver is sterling, the rivet is brass. Sizing: We are unable to change the size of the bracelet once it is ordered so please be sure to order the correct size. Again, the bracelet slides on the wrist and does not have a clasp. We STRONGLY suggest that you view the video below and print out the bracelet sizing guide to help you determine your size. Please make sure you print the page at 100% (do not scale page or the measurement will be incorrect). All names will be spaced equally around the bracelet. If you are just ordering two names we will stamp them about a half inch from the center point. The cost above includes two outer stamps and an inside stamp. The price will change according to how many stamps you put on the bracelet. Using the block font, there is an 8 character limit. If you need more than 8 characters we can do it using the Lizzy font but you will need to call us at 978.792.2555. Because these bracelets are customized, all sales are final.